WASHINGTON, Aug. 19 - Catching a life-threatening disease can be a life-changing experience. A little over a month ago, I felt bad. That’s the best way I can say it. I was at my father’s wedding in New Jersey - he’s 82 and a very hot ticket! - and something, I wasn’t sure what, was wrong with me. SINCE IT WASN’T one of those symptoms - headache, upset stomach - I could spell out, I shrugged it off and went to work that Monday. Still, something wasn’t right. By then, nausea was as good a word as to describe my condition. I took Tylenol and kept plugging along. "Hardball," my TV show, had an expensive new set, Phil Donahue was premiering the hour before me, and I had a job to do: Sparkle! By Friday, I was doing anything but. I was sweating like a pig and could barely hold my head up. I had to stick around the studio that night to go live with the Samantha Runnion kidnapping-murder case. The police were holding an evening press conference to announce the arrest of a suspect. I spent the awaiting hours on the Green Room couch. My temperature hit 103 - way too high for a guy my age. Still, I kept thinking - to the extent my brain was working - it was some kind of flu. The following weekend, I was delirious. My brain, which I had hoped to employ to finish writing a book and then a speech I had to give the following week, kept cooking on one impenetrable problem after another. Each crazed quandary melted into the next. My temperature hit 103 - way too high for a guy my age. Still, I kept thinking - to the extent my brain was working - it was some kind of flu. I could sweat it out. On Monday, I was heading for work with an extra shirt in my bag. The one I had on was already drenching. Finally, I did something smart and called my doctor. It was clear what I was going through was not going to go away by itself. Dr. Dennis Cullen agreed that I should come to his office. As he examined me, I told him my urine had turned maroon. He sent me to the emergency room at Sibley Memorial Hospital as I was dangerously dehydrated and needed an intravenous. Just as important, I needed to be tested. It was unmistakable from my blood smear, he said. The parasites that had taken over an unhealthy number of my red blood cells were all over it. Sign up for our health e-newsletter I had the species of malaria, falciparum, which is the most aggressive. It kills you either by clogging up the arteries to your brain or by simply killing enough blood cells to cause extreme anemia. Parasites had taken over 4 percent to 5 percent of my blood cells. A pathologist at Sibley told my wife Kathleen that he’d never seen so many parasites on one slide. With all those rioting bugs racing through my brain, no wonder I was delirious. The bottom line is that I’m a very lucky fellow. I had great doctors. I was given quinine, antibiotics and that wonderful intravenous that kept running fluid into me. I was in an air-conditioned hospital so nice they call it "Club Sib." I kept thinking, especially in those early days in intensive care, what it’s like getting malaria for the average African. You’re lying in some hut. It’s 105 degrees. You’re running a temperature almost that high. You have no quinine, no drugs whatsoever and no clean water. You just lie there sweating and delirious until the lights go out. Malaria kills an estimated 1 million people a year, according to the World Health Organization. Africa accounts for nine out of 10 cases. Children are the most vulnerable, with one dying roughly every 30 seconds from the disease. I suppose Africa, too, is where I was bitten. My family and I were there at Christmastime. Though all the books say you get the bad symptoms within about two weeks, I may have taken enough malaria pills to suppress it all these seven months. None of the doctors I’ve spoken to can quite explain how I got it. It may have been something I got visiting the West Bank in May or Vietnam last spring. It may be one of those rare cases of "airport" malaria where the victim gets bit by a mosquito that had just bitten someone who was infected. The important thing, I think, is how the experience affected me. There is no adequate emotional accounting for the effect of all those flowers, plants, fruit baskets, letters and phone calls. Or for the calm joy of simply having my crazed career engines turned off for a couple of weeks. Or for the love that has flowed from Kathleen and the rest of my world. 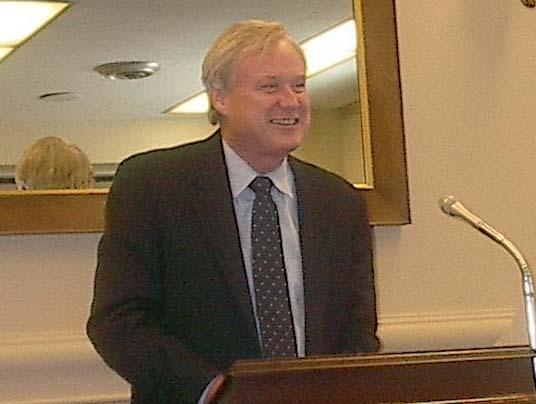 Chris Matthews, author of "Now, Let Me Tell You What I Really Think" (Free Press, 2001) and "Hardball" (Touchstone Books, 1999), is a nationally syndicated columnist for the San Francisco Chronicle and the host of "Hardball." Tune into "Hardball" at 9 p.m. ET, M-F, exclusively on MSNBC cable. Dear Chris, We in our Family wish you a Full recovery and soon! You inspire us each day and have for many years.